Sunburned face, tired feet and a nose full of ash*. What's that add up to? 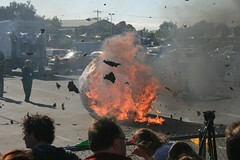 A day at Maker Faire 2007! Once again, the robots, geeks, nerds, hippies, hackers, freaks, kids, and guys-on-segways came together to put on and attend the Maker Faire. It is, in their own words, a "two-day, family-friendly event that celebrates arts, crafts, engineering, science projects and the Do-It-Yourself (DIY) mindset. It's for creative, resourceful folks who like to tinker and love to make things. We call them Makers." Annette and I took Liam today, it was a blast. So much to see. I took (probably) over 300 photos, and we didn't even cover everything. I've uploaded a crapload (i.e. 160) to flickr. Our friends, Toast and Jillian (aka BecauseWeCan), had a booth again this year, showing their wares. The LED Coffee Tables were a BIG hit. The day ended with a show by SRL. It f'n rocked. We were in the stands, but it was too loud for Liam (despite the earplugs) and so Annette took him some place safe. That turned out to be a good thing, since the bleachers got flooded with smoke, ash and, of course, noise. Groovy.